The purpose of the Relief Society Magazine, which began in 1914, was to unite LDS women in a bond of common interest, to educate, and enlighten as well as to be an outlet for Mormon women’s own writing. It was the official publication of the Relief Society organization for 57 years until 1970. The Relief Society minutes of October 1, 1914 state that the magazine will consist of literary, artistic, and practical articles, designed to improve our minds and beautify our homes. It also published fiction, poetry, and plays written by Mormon women. The contents were modified over time to meet changing circumstances. 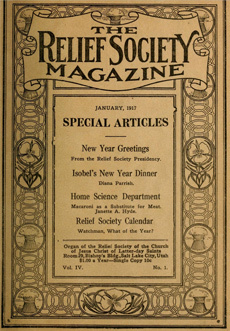 The Index to the Relief Society Magazine includes the major standard categories of material: Lessons, Articles, Fiction, Poetry, Plays, Editorials, Recipes, Notes from the Field (ward and stake RS information), Happenings (about individuals), Images, and Advertisements. If you have questions or comments, please contact Connie Lamb, 1202 HBLL, 801-422-6196, connie_lamb@byu.edu. Each category may be searched using the applicable fields under the “Advanced Search” tab, or the entire magazine can be searched by using the “Basic Search” tab. Under “Advanced Search,” entries in each category may be browsed by clicking on the category heading. Use an * for truncation. On the results page, click the column headers to sort the results displayed.